"Stephen Richardson has taken over as Baron Ochs and, amazingly, his marvel-lously leering, tongue-out, hangdog style is compelling. Richardson's Ochs is youthful and wicked, natural as a comedy king and emotionally truthful." "...but of course it's english bass baritone Stephen Richardson in the role of Falstaff who determines the success of this romp..."
"As Ochs I saw the second cast, Stephen Richardson - John Tomlinson was singing Orest in Covent Garden - and I am very glad I did. Finally a fresh and steady voice from top to bottom, a singer who can deliver the words and notes with refinement and humour rather than speak, shout and bark through the part other more famous singers often do. And played the Baron as rather young and dynamic if not very noble "bonvivant" who as lady-killer is at least more convincing as the jolly old buffo type we are used to seeing in this role." "Stephen Richardson on the other hand was totally comfortable with Sarastro's lowest notes, and projected the appropriate benevolent authority." 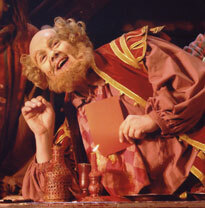 A warm affectionate portrayal of a character who contains elements of Ochs and Falstaff." "Stephen Richardson is an exceptionally accomplished Timur"
"Then followed the coronation from Boris distinguished by the superbly thickly russian commanding Tsar of Stephen Richardson." 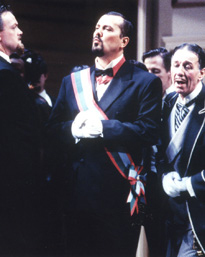 Falstaff Sydney Opera House 2006.